Today’s recipe for sausage and fennel pasta sauce may not be the most photogenic (probably also not helped by my dark kitchen!) but it makes up for this by being incredibly delicious. As the evenings draw in I’ve started craving some comfort food. Goodbye salads, hello stews, roasts, …and sausages. Yes, sausages have been the root of my craving this week. Whilst you can’t go wrong with good old fashioned bangers and mash or a sausage casserole, I recently saw a recipe for spicy sausage pasta in a magazine, which got me thinking about sausage pasta sauce. 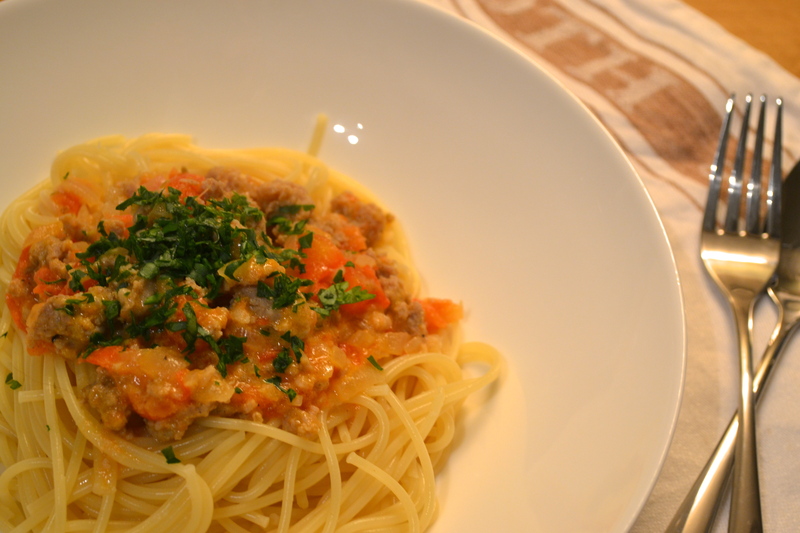 The spicy sausage recipe I found was a little bit too healthy to meet my autumn comfort food criteria though. 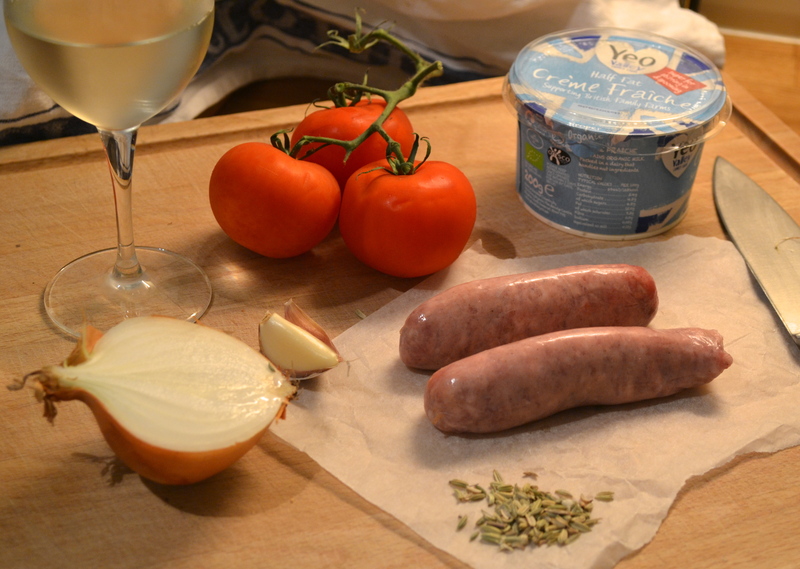 So I went off piste, combining sausage meat with fennel – such a great combination – with some garlic, onion, fresh tomatoes, white wine and creme fraiche to create a fantastic, speedy mid week supper. Definitely worth a try and incredibly moreish! 1. Heat the oil in a saucepan over a medium heat. Add the onion and cook for 5-10 minutes until softened. 2. Whilst the onion is cooking, peel, quarter and de-seed the tomatoes. To do so, make a small cut in the skin then place in just boiled water for about a minute. This will make the skin easy to remove. Cut the tomato flesh into thin slices. 3. Add the garlic and fennel seeds to the onions once they are softened and cook for a further minute. 4. Run a knife down the length of each sausage to cut through the skin. Peel off the skin and add the sausage meat to the pan, breaking it into small chunks as you so do. Turn up the heat to high and cook for 3 minutes. 5. Add the tomato and cook for a couple of minutes before adding the wine and allowing this to reduce down for 5 minutes over a high heat. Season to taste with salt and a good grind of black pepper. 6. Just before you are ready to serve the sauce, add the creme fraiche and allow to heat through until bubbling. Serve with a sprinkling of parmesan on top. The sauce can be made up to a couple of days ahead and reheated.